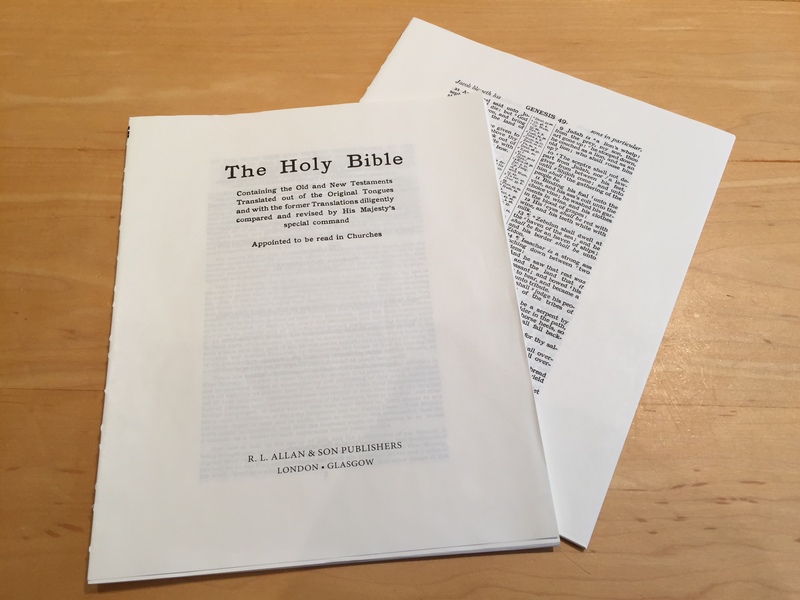 Somewhat later than originally intended, here is a more rounded account of the recent re-print and rebind of the Allan Brevier Clarendon Wide Margin Bible. 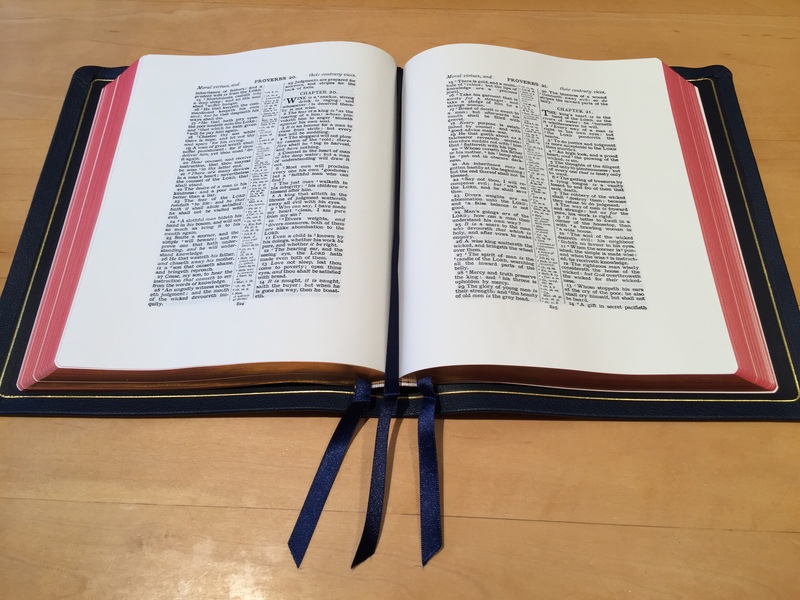 The KJV Brevier Clarendon Bible is a vintage Authorized/King James Version reference edition, developed by Oxford University Press and now published exclusively by R. L. Allan. 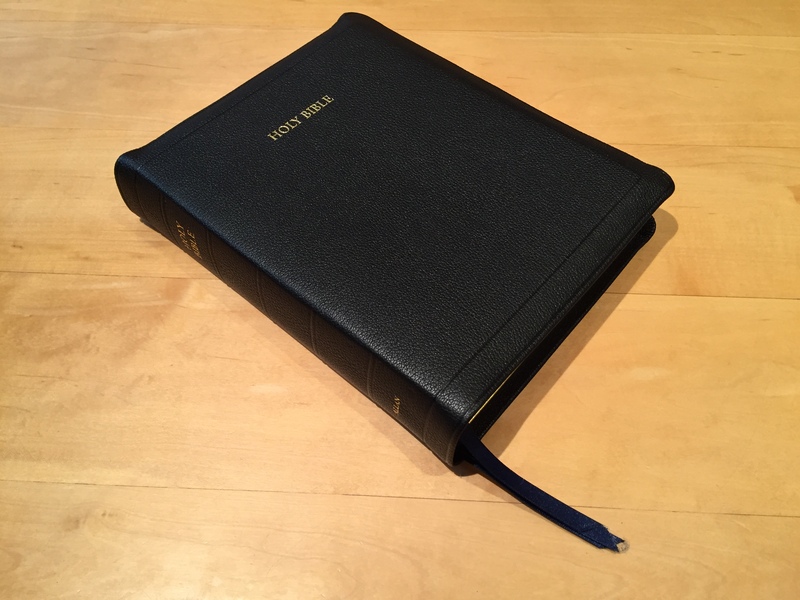 The Wide Margin edition is particularly prized for its substantial margins and writeable paper, with the highest levels of opacity, making it the ideal Bible for intensive study and notetaking. 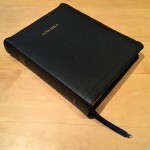 Surprisingly perhaps, the previous 5WM goatskin edition substantially outsold the ‘standard’ (paste-off) 7WM split calfskin edition (if any edition of this particular Bible can ever be described as standard!) 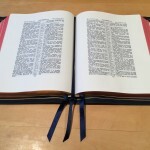 – and left us with a very clear challenge when it came to reprinting a Bible that had found so many committed buyers. We were fortunate enough to be able to visit with the printers, Jongbloed, in the Netherlands, and talk through in detail our particular needs in terms of opacity and writeability for the paper on this edition, since the previously used 38gsm ‘SG’ paper was no longer available. 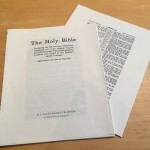 It transpires that opacity and writeability do not necessarily go together, but after balancing the merits of various options we eventually settled on a significantly higher weight PrimaBible 45gsm paper that has improved writeability characteristics and opacity, while adding only 1mm or less to the spine width as compared to the previous edition. The results bear out this decision, with outstanding print quality – though of course the page image itself still bears the marks of its vintage in broken type and lithographic ‘spread’, which emphasises the textual boldness at the expense of crispness – and a beautiful contrast to the creamy, 1.5 inch wide outer/inner margins (1 inch at top and bottom). The classic 5WM edition is bound in Black natural grain goatskin with a generous yapp, leather-lined in dark blue with gilt line inside, hand-pleated corners and double-sprayed red under gold page edges, three navy blue ribbon markers, with Allan presentation pages and family record in our latest Charles Rennie Mackintosh-inspired design, as well as 26 pages of blank notepaper at the back of the Bible book block for further note taking, and 16 pages of full-colour Oxford Bible maps. For 2016 we have also added a Navy Blue option, and upgraded the ’7WM’ paste-off edition to the beautiful natural grain Buttero Calfskin. We have also been working with Jongbloed on some other incremental improvements to these Bibles, including a new semi-matt finish on the 5WM natural grain goatskin editions – bringing this range much closer to ‘Highland’ feel and appearance – fully hand-pleated corners, double-sprayed page edges for a deeper art gilt effect, and improved flexibility in the hinge at front and back of the Bible so it lies flatter when closed and opens more easily to the first and last pages. The 5WM in Navy Blue is proving particularly popular at this point but with its embodiment of traditional values, as it were, we fully expect the standard Black 5WM to be once again the edition of choice for the majority of users.